Hey guys. I haven't written in a long time, but this is mainly because not one person gave me a suggestion on what to write. I decided to make this post on Hyrule Castle, a place in the game where almost no information is give. All you do is sneak through the courtyard. But I'm here to give some straight-up facts. Let's start out simple. Hyrule Castle is located far up north in Hyrule. 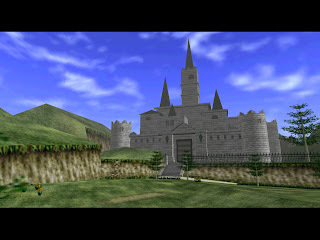 It is home to the royal family, which is Zelda, her father who is the king of Hyrule, her mother, who we presume is alive, and probably other relatives. Other people living in the castle are the guards, maybe some servants, and the few remaining Sheikah (who swore allegiance to the Royal Family ages ago). Seven years later, Ganondorf took over the castle and made a moat of lava around it for protection from intruders. Obviously, Ganondorf made a few changes in the castle. He probably changed the whole layout, adding and changing rooms, bringing in monsters and getting rid of old inhabitants. I think he actually killed the king of Hyrule, otherwise, people would have talked about him. This also means Zelda's mom was also killed (most likely). It looks like Hyrule Castle has a bloody history, and was probably re-built many times. I'm urging all followers to please send me some suggestions on what to post about, because this blog is for everyone. Just comment below or email me at zeldafacts@hotmail.com. Thanks. Well, do people visit this blog? Because if they don't, you obviously won't have anyone to send you ideas.